“God so loved the world that he gave his only Son, so that everyone who believes in him might not perish.” The world that God loves is not some idealized place where people try to live in justice and peace. It is this world: with all the crime, dishonesty, wars and constant feuding that divide people. With all the greed and pettiness; this world with all its sickening teenage bullying and Ferguson Missouris: this is the world that God loves so much. This world is so loved by God that he seeks to bring healing and new life to it. Faith or “believing,” is the “ladder” out of the chaos we humans create in this world. It is ladder freely provided by God. But it is also ladder we freely choose to climb. No one can climb it for us. We must faithfully climb it ourselves. Faith is not just a matter of saying “Lord, Lord” or simply wearing a cross around our necks or cleverly being able to quote bible verses. To believe in Christ is to live the life he asks of us. It is to pursue good and resist evil. Believing demands a constant striving for integrity in our lives and relationships. Climbing the ladder is challenging. It requires perseverance and energy. But this is how the world in all its craziness is transformed: person by person, relationship by relationship, family by family, community by community, each choosing to “climb the ladder” toward harmony with God ,with ourselves and with our neighbor. We’re now halfway through Lent. Let’s pray for one another. Pray, that we’d each find and embrace our own way of transforming our little piece of this word, the world God loves so much. Today’s Gospel is profound and beautiful but we may miss the meaning because we have heard it so many times in the past. That old adage, “Familiarity breeds contempt” certainly plays out here. You may have even let your mind drift as I read it to you, just as my mind drifted when I read it this past week in preparation for this service. What did it mean for God to give his only Son? Mothers and fathers of soldiers would know, especially if their son ended up making the ultimate sacrifice, just as Jesus did. They would know the intense grief of the sacrifice but would also understand that their son wanted to serve his country. Their hearts might swell with pride even as they grieve and never forget. You may be thinking, “Yes, but Jesus is God and therefore He cannot really die.” As a man however, Jesus did die. And He suffered greatly in body, mind and heart to make His ultimate sacrifice. Just as parents suffer when their children suffer, so did the Father also suffer. Are we so concerned with avoiding hell that we fail to recognize heaven right here on earth? As children, growing up in the pre-Vatican II church (which I grew up in too), teaching the faith centered a lot on following rules, guilt and fear of hell. I remember the “fire and brimstone” homilies of the young priest at the parish of my childhood and how women would leave the church weeping as a result. Yet somehow during communion, I understood that I was receiving a taste of heaven and would think of images of a floor swept clean, glistening with the shine of wax, or of a rose bush growing in my heart. The Eucharist represented purity and beauty to me; I was blessed with a sense of heaven in my midst. The last part of this reading is hard: again we are reminded of condemnation. But we are only condemned if we decide to walk away from Jesus, to turn our backs on him, to deny him. If however we love him and desire him in our lives, we will not be condemned. We will not live perfect lives for in our broken world this is not possible. Jesus’ mission centered so much on mercy precisely because he understood us. Again and again he offers opportunities for reconciliation and relationship as shown through his free association with the “sinners” of his day: the tax collectors and prostitutes. There is nothing he will not forgive so long as we choose to accept it. So long as we have breath in our bodies he will accept us. Just recall the thief on the cross who with his dying breath asked for Jesus to remember him. We know his reward: he was the first to taste paradise. The same awaits all of us who love the Lord and try each day to follow him. So what can we do to stay close to Jesus so we can experience more of heaven on earth? Perhaps read the Bible? 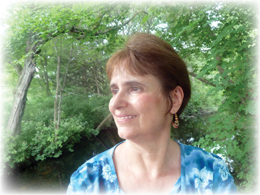 Listen to the beautiful music composed over the centuries that glorifies God? Just sit and think about Jesus? Reach out to someone who is hurting or lonely and be Jesus to them? What will we choose to do today? I have known M. Regina Cram since high school. Her family is like my second family. The same is true for my husband. He came to know Reg first while I was friendly with her older sister Ginny first. We have all been through a lot of weddings, funerals, tragedies and births together. And all throughout those years we sang together, going through the meticulous journal of songs that Reg and Ginny kept. I’ve known that Reg has written a regular monthly column for the Catholic Transcript, the official newspaper for the Hartford, CT diocese. Secretly I dreamed of her writing a book. And she finally did! 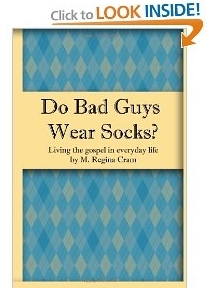 It’s called Do Bad Guys Wear Socks? Living the Gospel in Everyday Life. I’m taking my time reading it because it is so enjoyable and someday soon I will review the book and feature an interview with Reg. Six words. That’s all. Six simple words, but each time I uttered them, my throat tightened and my eyes burned. These six words brought me to tears many times that first week after a shooter massacred 26 people in an elementary school in Newtown, also killing his mother and, at the end, himself. Our daughter Tierney and her husband Andrew settled in Newtown after their wedding a year ago. Andrew grew up there. His family lives in town. His brother went to school with the gunman. In the light of the shootings, the verse rankled me. I mean, seriously? God loves the whole world? Everyone? He loves a man who slaughtered 20 babies and the educators who tried to protect them? Jesus died for someone like that? I also wrote something about Newtown which you can read here. I wish now I too had included the killer.